Everything in Alaska seems to be supersized. 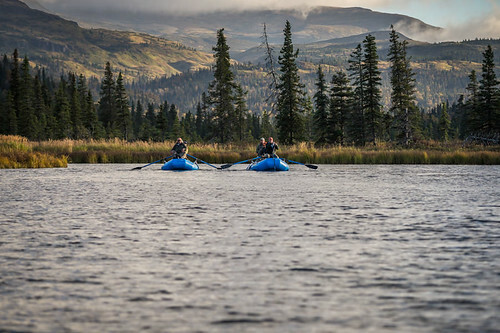 Not only is Alaska the largest state in the union; it is also home to North America’s largest mountains, moose, bearded men, crabs, salmon, sled dog race, and most importantly: rainbow trout. When it comes to fishing for rainbow trout Alaska holds the crown for the world’s marquee fisheries and the rivers in the lake Iliamna drainage in the Bristol Bay region is dead center for the best and most famous of these legendary fisheries. Iliamna lake is the second largest lake completely in the United States (eclipsed by Lake Michigan, the other great lakes share a border with Canada). 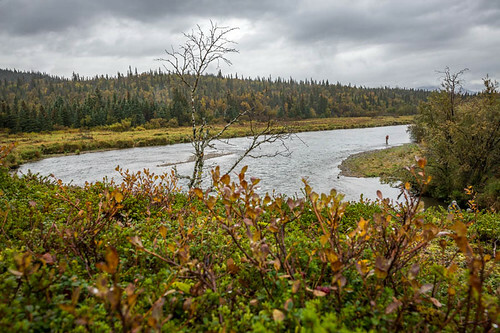 The mighty Kvichak river which is the outlet of Iliamna offers a direct conduit to the Bering Sea and is the avenue by which 5 species of salmon infest the system in July, August and September. The Iliamna system is home to the world’s largest salmon run with millions upon millions of sockeyes flooding into the lake and the surround tributaries each summer. 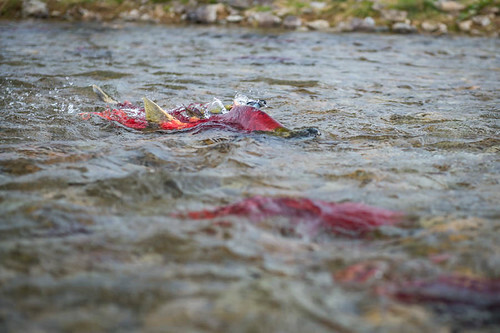 These salmon quickly turn a brilliant red color (often nicknamed “reds”) and rapidly fill many of the rivers from bank to bank with billions of calories of nutrition imported from the productive waters of the northern Pacific. Lake Iliamna and other lesser but still massive lakes in the region such as Naknek, Kukaklek, Nonviunuk and many others offer winter protection for salmon smolt and the giant rainbow trout that feed on them. While resident fish in region’s productive rivers frequently top 20” it is the prospects of these massive lake run rainbows that frequently stretch beyond 30” that attract anglers from around the planet. While many of the region’s salmon species including silver and king salmon are fantastic game species in their own right, it is the mind boggling numbers of sockeye salmon that drive the system. When millions of female sockeye each release several thousand eggs into their home spawning river an unparalleled volume of nutrition fuels a feeding binge among the regions rainbow trout, dolly varden and grayling producing extremely well fed and girthy angling targets. 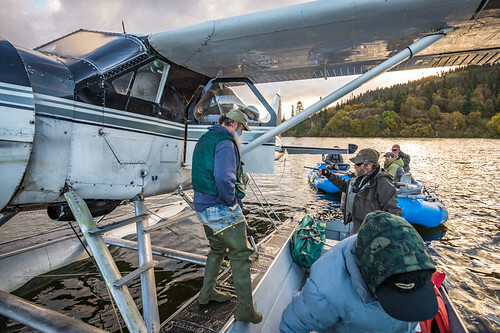 We chose Intricate Bay Lodge for our recent September trip to the Bristol Bay region to target several of Alaska’s finest trophy trout waters. Intricate Bay is an attractive option for several reasons. The original lodge had experienced a fire in the 2014 season and the new lodge was rebuilt from the ground and no stone was left unturned. With space for just 10 guests it offers a refreshing atmosphere compared with some of the larger lodges in the region and their highly structured fishing programs. The smaller guest count also allows for a much more fluid fishing schedule and it is easier for the pilots and guides to adjust fishing locations based on angler preference, fishing conditions and weather. 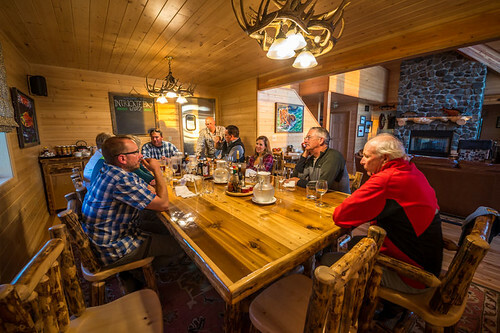 The lodge is also the closest fly out lodge to the legendary Copper River which is arguably Alaska’s most productive and consistent rainbow trout fishery. Pilots at intricate Bay can fly guests and guides into several different floats on the upper reaches of the Copper in a quick 12 minute flight. In addition to the productive Copper system the fabled waters of Katmai national park are within easy striking distance of the lodge including the Moraine, Battle and Funnel creeks to name a few. 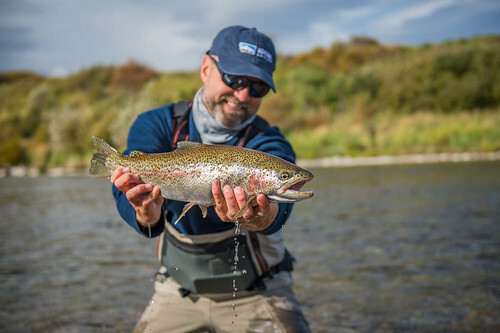 Lodge guests can also target the legendary Kvichak and Newhalen rivers and where massive rainbows are landed every year. 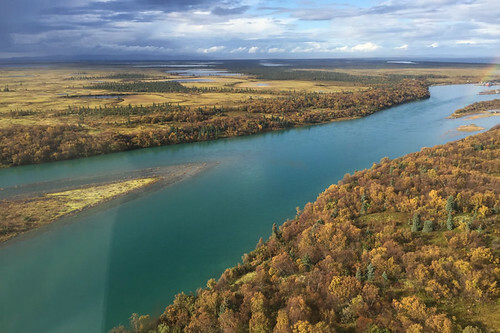 When conditions timing is right anglers can also target silver salmon in coastal rivers or Kings on the Nushagak. IBL keeps numerous jet boats stashed on various lakes and rivers in the region and also flies in small NRS rafts that are inflated on site for back-country floats. The lodge is also just a 10 minute jet boat ride to the mouth of the Lower Copper which is a great option on arrival day or on days if the weather is poor for flying. The Gibraltar and a few smaller streams can also be access by a larger lake boat from the lodge to add even more variety. Our scheduled arrival day at the lodge was Sunday so we flew to Anchorage on Saturday with plenty of time to check in to our downtown hotel and explore some local pubs to sample the local brews and fresh halibut. The following morning we took the morning flight on Iliamna air taxi to the small village of Iliamna which is a two hour flight. 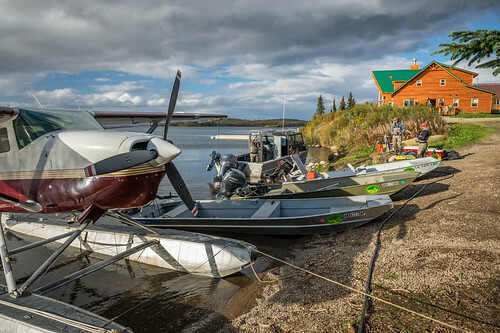 Normally the lodge pilots are waiting in Iliamna to fly everyone to the lodge followed by 6 hours of fishing on the lower copper by jet boat. We drew the short straw with the weather as the worst storm of the season was hitting hard with damaging wind alerts back in Anchorage forecast at 90 mph. With the strong winds the lodge pilots opted to play it safe and wait until the next morning to pick up our crew. Luckily our host Brian Harry at IBL had arranged for us to spend the night at Bristol Bay Sportfishing Lodge which was road accessible from the village. Our home for the day turned out to be very comfortable and we enjoyed some wonderful hospitality offered by owner Jerry Jacques and his staff while waiting for the weather to break. The next morning the storm had settled and the winds had dropped back to normal and we met Brian pilot Blake Larue for our ride to the lodge. Brian hauled our luggage in his plane and the rest of us jumped in with Blake in his DeHavilland Beaver. Beavers are the defacto bush planes of backcountry Alaska. 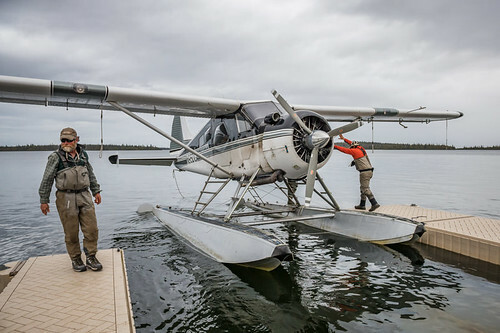 DeHavilland quit producing them in 1967 but there is still no aircraft that can compete with Beavers for reliability and hauling capacity for flights under 100 miles so they are the floatplane of choice amongst Alaskan bush pilots. After a short flight across the lake we landed at the lodge. The lodge itself is extremely comfortable and well designed. Wood floors and tongue and groove cedar walls and ceilings give it a warm feel. The rooms are large and well appointed with plenty of cubbies and hanging areas along with comfortable beds. The large open floor plan offers vaulted ceilings and a wall of windows to take in the spectacular views and sunsets across the lake. A huge deck overlooks the lake complete with wood fired hot tub. After settling into our rooms we suited up in our waders and jumped in jet boats. Our guide Wade grew up in a guiding family and his first job was guiding at his uncle’s lodge on the Kvichak river. Ann, Diane Rozier and I jumped in with wade for the short 10 minute jet boat ride across the bay to the mouth of the Copper River. As we rocketed up the Copper it looked like a salmon graveyard as thousands of dead sockeye salmon lined the bank. The late run sockeyes were a brilliant crimson and parted in front of the boat as we zoomed past. Wade quickly chimed in “smells like big rainbows!” as a subtle scent of fish wafted over the gunnel. Running jet boats up these small rivers is like riding in an Indy car as the guides keep them moving fast enough to stay on plane resulting in an extremely shallow draft allowing them to move through even the shallowest riffles with ease. We stopped at our first run of the day and Diane took the first shot at the head of a riffle. On her second cast she hooked a monster - what looked to be a 26” rainbow that eventually broke off after a few runs. What a way to start the trip! Our tackle consisted of 6 weight fly rods with straight flouro-carbon leaders. I ran about 5 feet of 30lb flouro from my fly line to a swivel and then another 5 feet of 10lb flouro to the “bead rig”. Once salmon start dropping eggs trout become focused and selective on the calorie packed food supply. Small plastic beads are the defacto choice to match the “egg hatch”. A small egg is tied or pegged to the tippet with an egg hook trailing about 1.5” behind. Eggs are a transparent orange color when fresh but as some of the nonviable eggs age they turn a cheese curd color. Guides carry an assortment of colors and sizes and sometimes even add cream nail polish to imitate a moldy egg look - sophisticated stuff! The tail end of the storm produced a steady rain but temperatures were in the high 50s and we were quite comfortable under our gore-tex waders and jackets. The fishing was absolutely off the charts good. I’m not sure exactly how many trout we hooked and landed on day 1 but collectively it might have easily approached 150 trout. I literally hooked 3 trout in 5 minutes while wading up a riffle as the trout snuck up behind me to eat my egg as it trailed a few feet in the water behind my feet. The trout were extremely healthy with most ranging from 16-22”. Even the 18” bows had bellies so large it was difficult to get a hand around them. After weeks gorging on salmon eggs these trout were lightning strong and frequently left on long, blistering runs. Jim Matejka from Albany New York netted the big fish of the day with a nice 2 footer just after lunch. By the end of the day we were pretty much giggling with how spectacular the fishing was. On day 2 we ventured into the remote middle section of the copper river which can only be access by air. The lodge is only 12 minutes by air to this access area and also has a coveted mooring permit in the middle of a small lake that connects to the middle of the river. They are able to leave a jet boat in the middle of the lake all season with a solar bilge to keep it from filling up with water in a heavy rain. The guides flew out ahead of us with 2 small rafts and then Blake flew back to pick us up. 6 of our crew was headed to the middle today. Ann, Diane and I were going to jet upriver for the day with Monte Becker while the 4 guys making up the Albany delegation where rafting down river to another lake. After a quick flight from the lodge we landed on the lake and taxied to the middle where the guides, jet boat and 2 rafts were waiting for us. I have fished with Monte on several other occasions in Chile. Monte is a seasoned veteran and true pro. He has made Chile his home for over 30 years where he started one of the original fly fishing lodges in Patagonia. He now guides for our friend Eduardo Barrueto at Magic Waters. We introduced Eduardo to Brian Harry of IBL at the annual guide rendezvous in Missoula which is how Montey hooked up with Brian - small world! In spite of working with anglers of all abilities for over 3 decades Monte’s level of patience seems to have no bounds and he is always more than happy to take his time to explain the finer points of the fishery and techniques. Just minutes after our first stop at a long riffle we knew it was going to be a big fish day. All three of us hooked and landed multiple 20”+ trout within a half an hour. The weather had broken and the sun was shining allowing for some spectacular sight fishing. With so many fish already under our belt on the first day I chose to spend most of the middle of the day hunting for larger trout. I spotted several that looked to be close to 26-28” while managing to top out around 25” to the net. Just after lunch Ann and I took a break from sight casting to swing a leach. We were instantly rewarded with several nice 19-23” trout pounding the fly on the end of the swing. We spent about 2 hours wading together taking turns on the same rod, trading out after each fish. We rarely went more than 5 minutes between fish. The electrifying jolt when these big bows hit was a real pleasure to experience. At one point Ann hooked a monster - we never got a great look at the fish but a few times it surfaced to show its size with its tail fin well over 2 feet behind his head. Shortly after catching up with Monte and Diane who were working a riffle below us we spotted our first bear of the trip - a monster brown bear that was patrolling a huge back eddy in search of salmon. We set the rods down and spent the next 30 minutes enjoying the show as he submarined underwater, occasionally surfacing with a sockeye salmon in his jaws. Later in the afternoon we saw a few more bears. 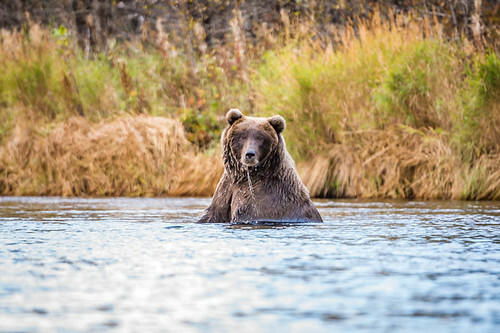 Luckily the bears in Alaska are very preoccupied with gorging on salmon and rarely give anglers the time of day. Although they are the same species as our grizzlies near Yellowstone these salmon fed bruins are double the size. Near the end of the day saw two fish that were absolutely enormous. They were hands down the biggest wild trout I’ve laid eyes on - definitely surpassing 30”. The first leviathan was holding in a deep seam with swirling currents and we didn’t have much of an opportunity to make a good presentation without spooking him. On my last run of the day I spotted another massive bow that was feeding in a catchable position but buck fever settled in hard and I blew my first cast and sent him racing for the depths of the pool. When it was time to head back to the lake to meet Blake for our flight back to the lodge we realized we had lost track of how many 20-25” trout we landed over the course of the day - easily over 20. A truly amazing day. Back at the lodge it sounded like the crew that rafted had an equally memorable day. Dinners at the lodge each evening were always a treat with Chef Kevin preparing freshly baked breads, local seafood, lamb and even prime rib over the course of the week. On our second night at the lodge we also took the opportunity to rest our aching muscles after fighting so many big trout with a soothing soak in the wood fired hot tub while watching the sun set over the bay. By our third day we opted for a shorter day to catch our breath and make sure we kept some juice in our casting arms to sustain the full week. The fishing was so good on the Lower Copper that we decided to make a return visit, get a few solid hours of fishing in and then return to the lodge for a late lunch Kevin offered to whip up for us and then facetime the kids back home to beat the time zone difference before bedtime arrive with their Grammy. The Copper didn’t disappoint and my appreciation for this amazing river continued to climb. I had so much fun swing flies the day before I decided to stay with the egg sucking leach all morning and cover a lot of water. We fished with Wade again, hitting several productive riffles. Ann and Mike stayed in the riffles while I tore off downstream walking and casting. The Copper is big enough to run jet boats on but small enough that in many areas you can wade right down the middle of the riffles and long glides. I made long casts quartering downstream and let the flies slowly swing along the current, mending occasionally to slow the swing if a belly formed. Most strikes came near the end of the swing resulting in a rapid shoulder jarring take on the tight line. Although swinging produced a lower catch rate than nymphing eggs, I felt like the average size was probably better and I was already feeling a little guilty with the rate of catching that we had sustained. Catching 15-20 nice bows on the swing seemed a little less glutinous than the frenzied action that fishing the eggs in the riffles produced. There is also something special about the hard take that you get when a big fish hits on the swing that adds to the excitement. After another fantastic morning it was a pleasure to get back to the lodge a little early and enjoy a casual afternoon and a spectacular autumn day. The massive Kvichak river is the outflow of Iliamna Lake. After exiting the lake it flows another 50 miles before entering the Bering Sea. The Kvichak holds the impressive title of hosting the world’s largest salmon run. Although multiple species of Pacific salmon enter the river the nothing compares to the flood of sockeyes that move up the river in July. At the peak of the run 30,000 salmon per hour move through the Kvichak on their way to the various tributaries that feed lake Iliamna. The Kvichak is also home to some of the largest rainbow trout in Alaska with an abundance of 27”+ trout in the system and 30” and larger trout caught each year by a few lucky anglers. Rainbows over 20 pounds are occasionally landed on this mighty river. The river is a 45 minute flight from the lodge and IBL has 2 jet boats stationed permanently on the river. The strong easterly winds from early in the week had pushed water across Iliamna lake resulting in elevated water levels in the river. Due to the massive size of the river and the higher flows we fished very long leaders - about 12 feet with 10 pound fluorocarbon and and 2 BB shot to get down fast. The Kvichak isn’t always a numbers river but it is certainly a place to swing for the fence, few rivers on earth offer such good odds of hooking and landing a 25”+ wild trout. Our morning started slow as we searched for good holding water. The high flows made it difficult to get to some fish in the bigger runs and the definition of the river features was somewhat masked. We picked up several grayling, dolly varden and a few small rainbows in the 15” range. After lunch our luck improved as we explored a long side channel. The smaller flows in the side channel made it a little easier to target the fish and on the first pass I hooked and landed a chrome bright 26” rainbow that immediately ripped into the backing. We made about 4 more passes though the productive channel and on each pass hooked at least one nice rainbow including another big bodied 24” bow. Although wading smaller and medium sized rivers ranks high on my list I always love the shot at fishing a mega river whether it is the Baker in Chile, the Limay in Argentina or the Kvichak in Alaska. There are just very few wild trout rivers of this size in the world and they always hold the prospects for huge fish. Knowing that at any moment you might win the lottery and tie into a double digit 10 pound plus trout adds a level of excitement that is without equal. The Gibralter is a short river near the lodge that is known for its large rainbow trout. Our day on the “Gib” started with a short float to Gibralter Lake with our guide Luke Coffey. The Gibralter is a short river and is an easy day float from the outlet of the Gibralter Lake to Iliamna Lake. Although some lodges roll the dice and try to land on Iliamna lake (which can be risky at the end of the day if the wind is up). IBL has the luxury of running a larger lake boat to the mouth for the end of the day pick-up to avoid the risk of landing on the huge lake. After blowing up a small NRS raft with a generator we set off for the outlet of the lake. As we were drifting through the slow, wide and shallow outlet headed for the faster water below we noticed a huge rainbow moving out of the way of the boat. The sun was up so we opted to do some sight fishing. The gravel filled outlet was filled with sockeye reds and although there weren’t many trout the ones we spotted were all very large and in the 22-26” range. It isn’t very often that I have the opportunity to sight cast to trout this large so rather than quickly move down into the pocket water below we opted to hunt for some quality fish. These big bows were fairly spread out and it took a while to find our targets. They were spooky in the clear shallow waters but definitely on the feed. Watching the big fish motor back and forth on patrol for free floating eggs spilling out of the redds reminded me of watching trout at the height of the PMD hatches in Montana when they are nearly quivering with excitement at the abundance of food in the water. Just like fishing our spring creeks back home I tried to place my drifts on my side of the trout hoping to pull the fish off of its feeding lane and reduce the chance of them seeing the leader. Luckily these big bows were more than willing to spring 3-4 feet to inhale any passing egg and as long as we could spot the fish we were able to hook most before spooking them. These fish were incredibly strong and each went on blistering runs across the gravel flats rivaling their saltwater brethren the bonefish. While fishing we spotted a huge boar brown bear 100 years below us catching salmon and later watched a sow and two cubs crest the horizon over a hill in the alpine tundra. Time flew by and after a few hours of extremely rewarding sight fishing it was time to move down river by raft. The fishing changed gears as we hit beautiful seams and riffles as the boat quickly navigated the swift pocket water. The fast gradient reminded me of the Stillwater or Boulder here in Montana, except with 18-27” rainbows in every patch of good looking water. We landed several more good fish including our biggest of the trip, two fish over 25”. At the outlet of the river we met up with a few of the other guests that had been wade fishing the lower river via the lake boat and caught a 45 minute boat ride across across the big lake to return to the lodge. All in all the spectacular sight fishing in the morning was probably the highlight of my trip. Our flight out of the village of Iliamna back to Anchorage was scheduled for the afternoon so we opted to sneak in a few more hours of fishing back to the copper. Ann and I were happy to join Monte Becker again for another round on this amazing fishery. 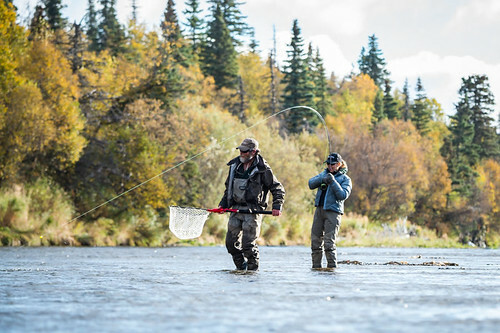 The Copper was the first river in all of Alaska to be designated catch and release fly fishing only. Many consider it to be the finest wild rainbow trout river in the world and after experiencing its mind blowing productivity it would be a difficult claim to refute. Not only is the copper productive but it is also incredibly beautiful and in my opinion the perfect size: big enough to hold large fish but small enough to wade comfortably. After a week of amazing fishing it was simply a pleasure to just soak it in on our final day and enjoy the eagles soaring overhead, the fall colors on the leaves and to admire a few more well fed Alaskan rainbows. Monte took the jet far upriver to some new water we had yet to explore. On our way out we saw one last brown bear - another huge boar that stood on its hind legs and towered to over 8 feet tall in a parting farewell. All in all our visit to Intricate Bay Lodge surpassed our expectations in just about every way. The lodge is top shelf and the location is simply spectacular on the banks of a secluded bay. The location is hard to beat with such close proximity to both the Copper and Gibralter rivers. Having the Copper as your home river is a great luxury in my opinion while still having the option to explore numerous other rivers in the region via float plane. After talking with Brian Harry we know we only scratched the surface in terms of the different rivers and streams in the area. Each peaking at different times. 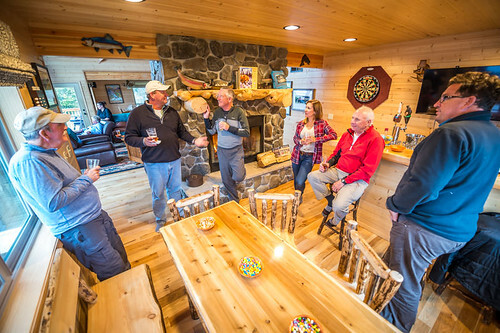 Intricate Bay Lodge offers a high quality product and a true Alaskan experience. We loved the small size of the lodge and the flexibility on fishing options each day and would highly recommend it to anyone looking for an amazing trip north!